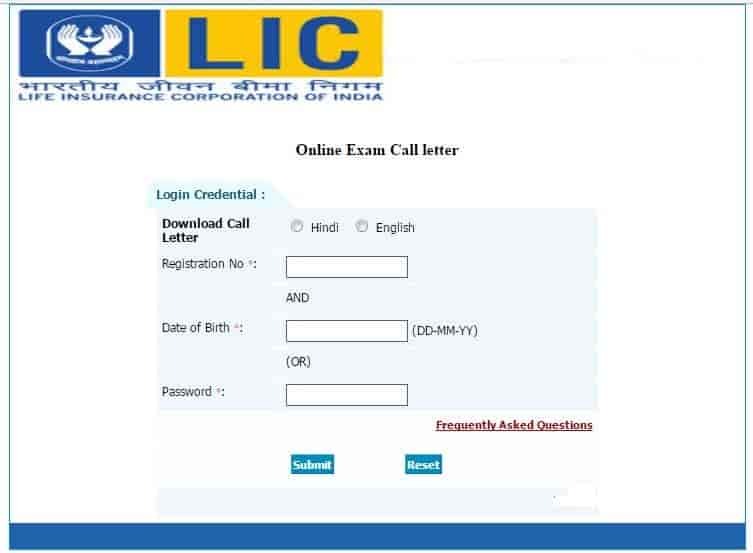 Release: LIC AAO 2019 Admit Card will be released on 26th April 2019. Website: Candidates can download admit from the official website i.e. www.licindia.com. Credentials required: Candidates need to submit Email ID/User Name and Password which they filled at the time LIC AAO 2019 Application Form submission. Step-1: Visit the official website i.e. www.licindia.com. Step-2: Click on the link on the home page where the admit card notification is displayed. Step-3: Once candidate click on the link, he/she will be taken to the main page. Step-4: On this page, there will be two options (Hindi and English) of language given to the candidates to Download the admit card. Step-5: The candidate has to enter his/her Registration number and Date of Birth/Password and click on submit to proceed. Step-6: Admit card of the respective candidate will be displayed, go through the admit card. If the candidate finds any wrong information on the admit card he/she can contact regional offices. Step-7: If not then download the admit card and print it off A4 size format. Make more than one copy of admit card to be secure from misplacing. In the admit card, candidates will be provided with the details about the examination centre and the date of commencement of the LIC AAO Exam, 2019. Candidates need to bring their admit card when they will arrive at the examination centre to appear in the examination. 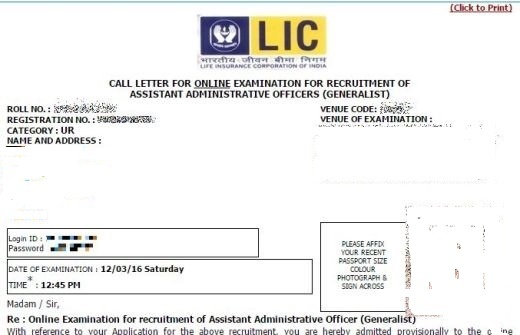 What details are printed on the IBPS LIC admit card? The admit card will contain details such as candidate's name, address, etc. When will I be issued an admit card? Candidates, who successfully make the submission of the online application fee, will be issued the LIC Admit Card. The admit card will be issued in the month of February 2017. When will i get my admit card for IBPS exam 2017? Admit card will be available from last week of February 2017. What if I don't bring my Admit Card during the exam? The candidates who are not carrying the Admit Card, will not be allowed to appear for the Examination.